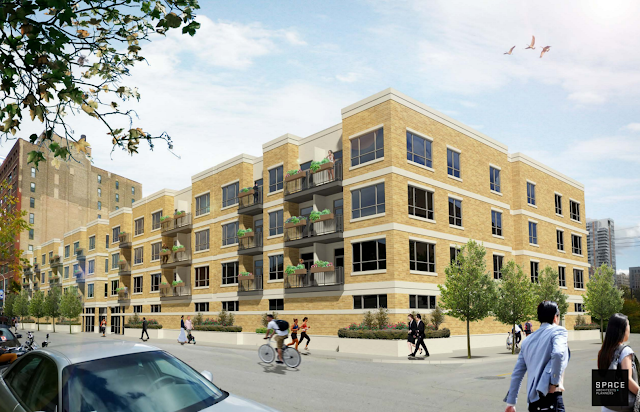 Sloopin - A South Loop Blog: Renderings Revealed for 4 Story Residential Building at 837 S. Wells? Renderings Revealed for 4 Story Residential Building at 837 S. Wells? I was able to get my hands on a rendering for 837-39 S Wells. It was done by SPACE Architects + Planners, but I couldn't find anything additional on their site. It is being developed by Michigan Avenue Real Estate Group and built by Vivify Construction. It looks like the concrete foundation work is near complete for the north side of the development. It will be rental at first and will likely convert to condos in a few years. It will be 84, mostly 2BDR, units with 2 small commercial bays on the first floor. Garage entry will be on Financial street.